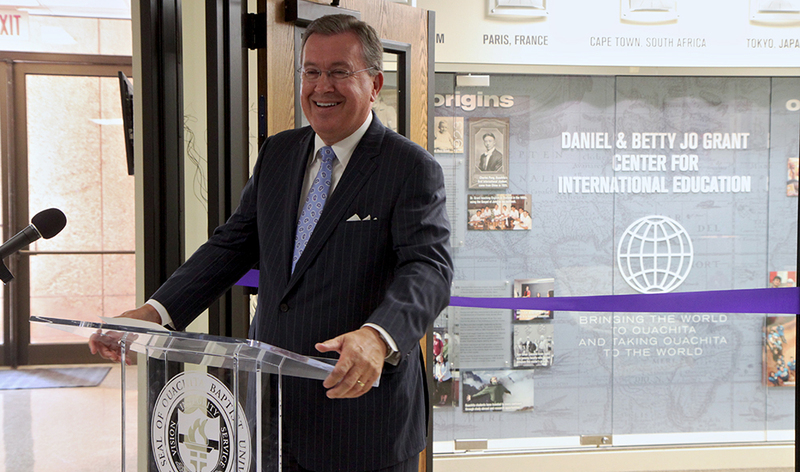 Celebrating the long-term impact of international education at Ouachita Baptist University, officials dedicated the newly renovated Daniel and Betty Jo Grant Center for International Education yesterday. Emphasizing that “the Grant Center is a place dedicated to educating the whole person,” Grant Center Director Ian Cosh, vice president for community and international engagement, said, “It specializes in educational experiences that touch all our senses and all dimensions of our humanity. 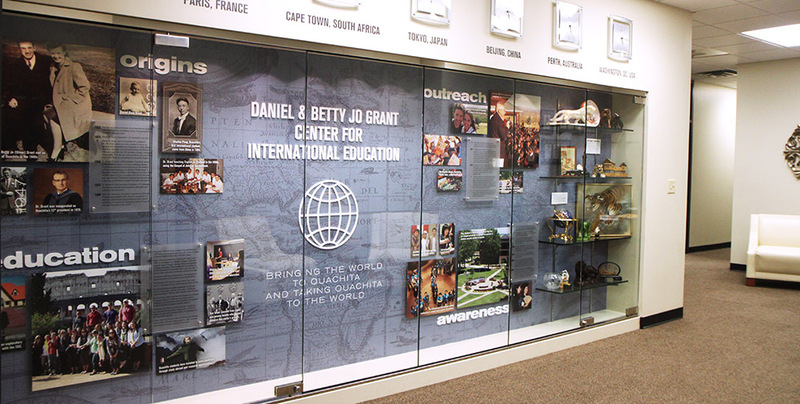 Highlighting the mission of “bringing the world to Ouachita and taking Ouachita to the world,” the Grant Center is named in honor of Ouachita President Emeritus Daniel Grant and his wife, Betty Jo. Dr. Grant served as Ouachita’s 12th president from 1970 to 1988. 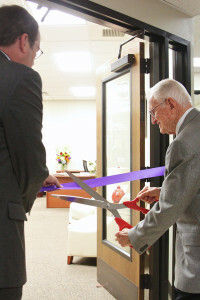 This summer’s Grant Center renovation coincides with the recent celebration of Dr. Grant’s 90th birthday as well as the 90th anniversary of Ouachita’s international education efforts. Charles Pong of Kaifeng, China, enrolled as Ouachita’s first international student in 1923. Nine decades later, the Grant Center recruits international students and provides Ouachita students and faculty opportunities to experience international study, both on campus and abroad. Primary funding for the renovation project came from a lead gift by Dr. Charles L. and Cindy Fuller. Dr. Fuller is a former dean of the Ouachita School of Fine Arts and Mrs. Fuller is a former instructor of voice at the university. Others who spoke at the dedication service include Zara John, a junior sociology major from India; Dr. Tim Knight, dean of the Patterson School of Natural Sciences; and Dr. Brett Powell, vice president for administrative services. Speaking on behalf of the faculty, Dr. Knight said, “Our students benefit directly when they get to study abroad. All of our students benefit from international and MK students here on our campus. It is obvious that our faculty appreciate these opportunities. Named spaces in the center include the Coulter Seminar Classroom named in honor of the Coulter family. Dr. Ed Coulter is a former vice president for administrative services at Ouachita and his late wife, Dr. Fran Coulter, was a professor of history. Dr. Coulter and his wife, Lucretia, were among those present for the dedication service. The Palmer Classroom is named in honor of Gordon and Melbaree Palmer, lifelong friends of the Grants. The center’s English as a Second Language office will be named in honor of the David and Jimmie Joe Leech family of Stuttgart. The renovation features an expanded reception area, conference room and enlarged classroom, providing expanded space for such uses as English as a Second Language classes and study abroad interest meetings. The entire suite was updated with new finishes such as carpeting, ceiling tiles, lighting, paint and technology. Also added during the renovations was a “legacy wall” that combines photographs and text layered on an antique world map. Funding for the legacy wall was provided by one of the Grants’ daughters, Carolyn Walton, and her husband, Bill. In addition, other friends of the Grant Center provided general endowments and travel awards to assist future study abroad students. Shirley Hardin, assistant registrar and daughter of Dr. and Mrs. Grant, said the legacy wall was created to honor the Grants, provide information about global education both past and present and inspire others to become a part of Ouachita’s legacy of international education. For more information about the work of the Grant Center for International Education, contact Ian Cosh at coshi@obu.edu or (870) 245-5320.